The update to v1.6 is a big update, which is available for free. It includes new resynthesis modes, additonal effects, a better user interface, enhanced sound and a large number of new features. Icarus 1.6 is downward compatible with all previous versions. All existing song projects and patches can be loaded without any further steps necessary. They will benefit from the enhanced sound quality. 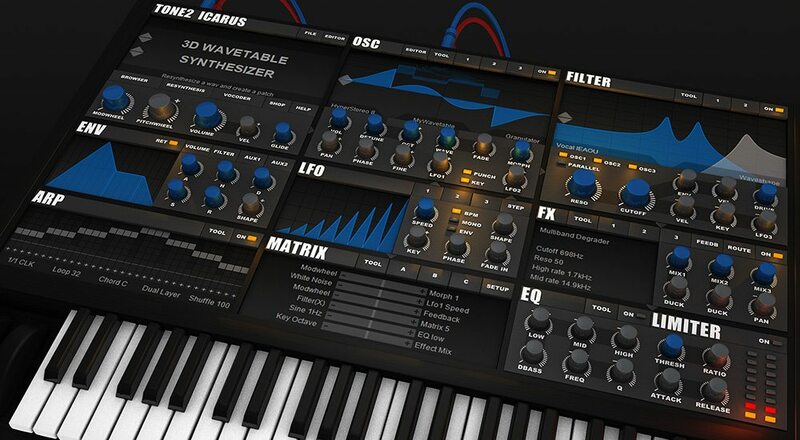 IMPORT SAMPLE->’Resynthesis smart pitch snap’ drastically enhances the sound quality of the resynthesis function. You can select a wav file and it automatically creates a synthesizer patch which syncs to BPM. IMPORT SAMPLE->’Resynthesis of melody’ is a groundbreaking feature. It can import complete phrases or melodies in wav format. It automaticaly programs a patch that sounds very similar to the original. It reprograms the melody in the arpeggiator. Futhermore it creates a wavetable with the harmonic content of the patch. The patches can further be tweaked, time streched or modified. IMPORT SAMPLE->’Resynthesis with dynamic pitch’ can import a wave. It automatically creates a patch which sounds similar to the original one. This mode does aly analyse the pitch information of the patch and programs the STEP lfo with a pitch envelope.